This applies just as well to this Cuban pearl whose autobiography is a compilation of so many biographies of its past residents: Generals, émigrés, industrialists, revolutionaries, and great artists. All have coloured its present with their mark on its past. 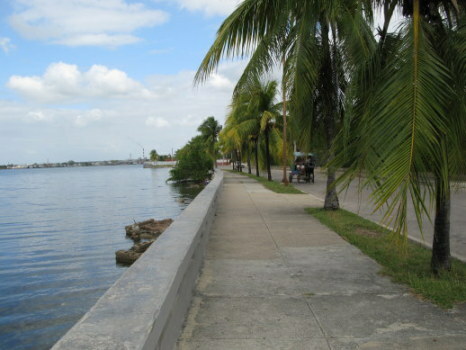 In 1819, Lieutenant Colonel Don Luis Juan Lorenzo De Clouet de Piette bestowed the challenge of creating a colony on the wide bay of Jagua upon Captain Cienfuegos, together with Intendente don Alejandro Ramirez. That is why, although literally meaning 'One hundred fires' the name of the city in fact has no relationship to this meaning, merley honouring its founder, the Captain of the same name. 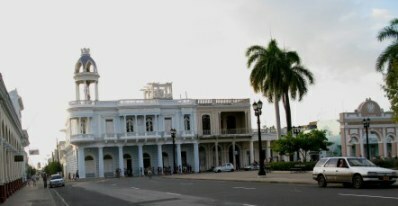 The request for colonization of Cienfuegos was made on 1st January 1819 and was quickly enacted. By 22nd April of the same year some 40 families arrived at what was then named Fernardina de Jagua. The settlers came from New Orleans, Philadelphia, and a small group from Bordeaux. The French heritage remains in the style of architecture, the wide boulevards, and beautiful parks. 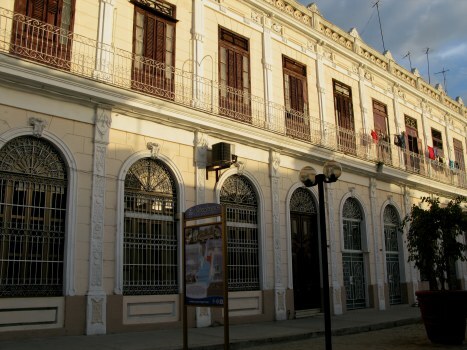 Cienfuegos is situated in the midst of plantations of sugar cane and coffee in central southern Cuba on the Caribbean coast. Originally the economic base was wax and timber, as well as it being a fishing port, but soon cane sugar was the driving economic force. Trade for sugar was predominantly with the United States of America. 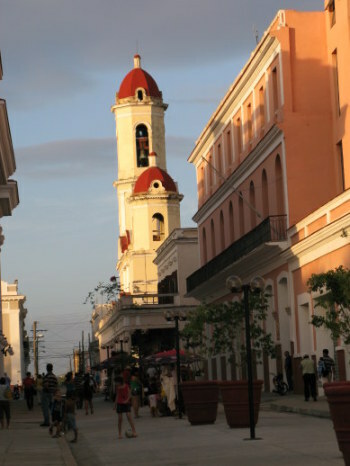 In just 41 years, by 1860 the new settlement had grown from village to town, and finally to be the third most important city in Cuba. 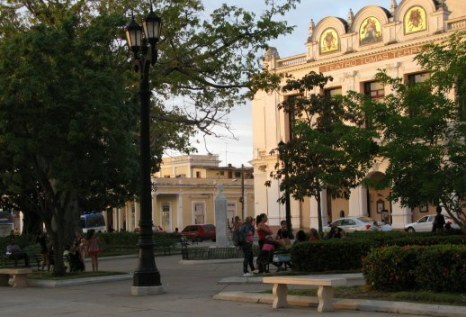 In 1976 it became the capital of the province of the same name, the smallest province in Cuba, being just 4,180 square kilometres (1,649 sq miles) and having a population density of 94.5 per km² (239.6 per sq mile). 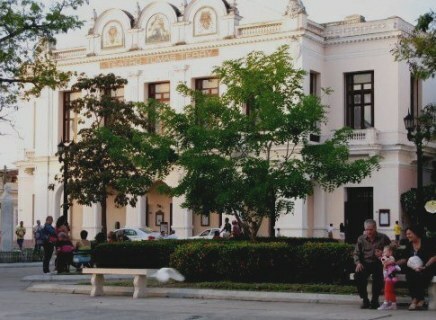 Settled under Spanish colonial rule, Cienfuegos was recently cited by UNESCO as being the best remaining example of a 19th century Hispanic colonial city. 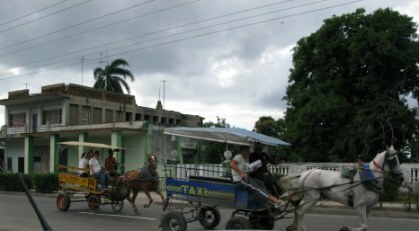 However as I entered the outskirts of the city, my first introduction to it was a feisty and impromptu 'drag race' between two mule wagon taxis. Drivers, passengers, and mules all seemed to enjoy the short burst before the two resumed a normal pace. 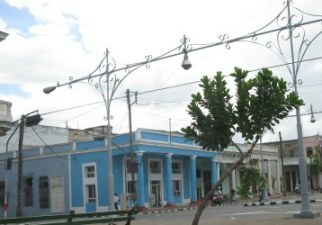 The air of grandeur in Cienfuegos still lingers, but the ornate lighting supports across the wide boulevards are somewhat out-of-place constructs, possibly added to make the central security camera more unobtrusive. As with many beautiful vestiges of a grander time in Cuba, many of the colourful buildings were sadly in need of renovation. 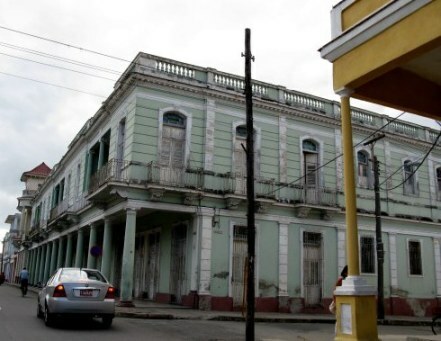 There is a housing crisis throughout Cuba, worst in Havana as rural people flock there in hopes of betterment of living. There is not sufficient housing to start with, and due to decay from no maintenance, many houses and apartment buildings are literally falling down. With families forced to live several generations together in one small apartment, the tall ceilinged apartments are often illegally modified to provide mezzanines. Inside and outside of the housing stock is therefore increasingly dangerous. Often what should be considered uninhabitable is inhabited out of need. In rural areas, many of the newly constructed houses were built by non-professional construction workers of the "microbrigadas," so that often structural faults of notable dimensions appeared even before they were inhabited. 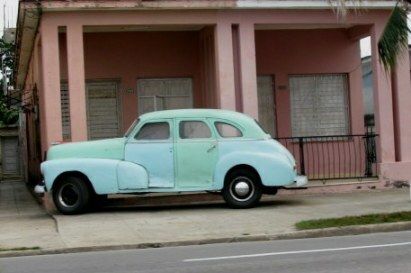 This is why when people say they have been to Cuba and have stayed only in resort hotels, I know they have not seen anything representative of Cuba's reality, its hardships, and its triumphant humour. By contrast to those in decay, buildings within UNESCO heritage sites and tourist sites undergo highest quality restoration or construction. The Cathedral has been well restored. In like manner, restored to former grandeur is the Union Hotel, which opened in 1869 and was once the property of Tomás Terry. In 1904 electricity was installed and in 1907 it was famed for it wine cellars which boasted 72 different types of wine.All this largesse was built on Terry's illegal importation and callous treatment of slaves - long after this was banned. Ceasing as a hotel in 1960 after the Revolution, the Union Hotel was transformed into residences. Sadly, these were declared uninhabitable by 1980. Various efforts at reconstruction and rehabilitation covered the intervening years until finally in 2000 the Union Hotel was again functional for its original purpose. Certainly details of a much grander life remain in both the structures and vehicles of the city, whether with vehicles are parked in the city itself…. 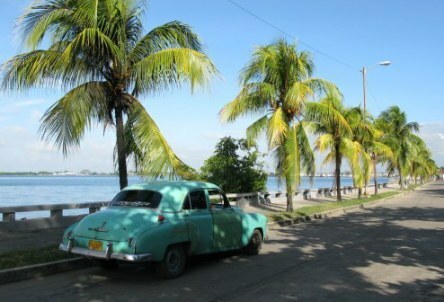 … or on the Malecón or seawall. 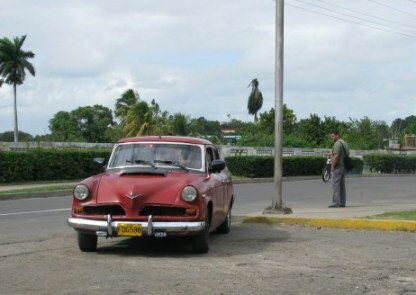 Here, a classic Studebaker was underway to a service station on the edge of the city. 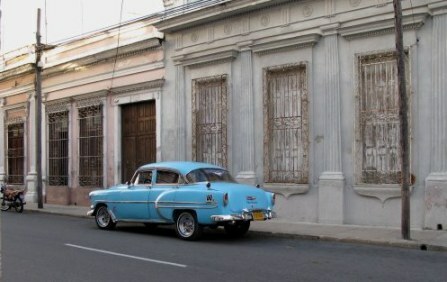 This parked classic car gave pastel contrast to a colourful residence. The city itself is colourful and peaceful. 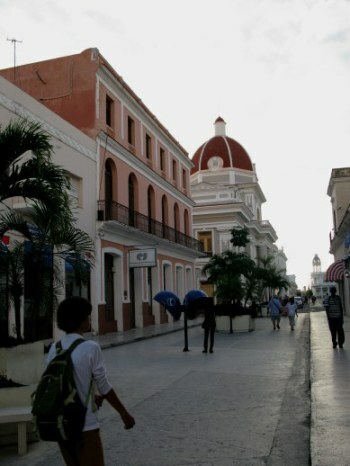 Central Cienfuegos is split by a pedestrian zone lined with civic buildings and shops. On the square at the end of the pedestrian zone is what was once a renowned place in the entertainment world. Here sang Enrico Caruso, and here danced Anna Pavlova. 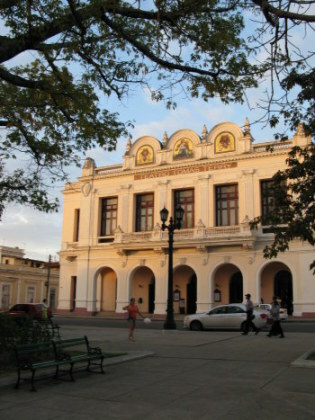 This is the once famous Tomás Terry Theatre which was built by, and to honour, the influential Venezuelan industrialist who had increased his wealth from Cuban holdings in the region. As I watched young dancers greet their teacher outside the Theatre, I found it fitting that a man whose immense wealth came from illegally importing slaves long after there were laws against this, and also reputedly selecting who would breed with whom, and not releasing either children born into slavery or those over the age of 60 - as was also the law - should benefit the descendants of just those same people. 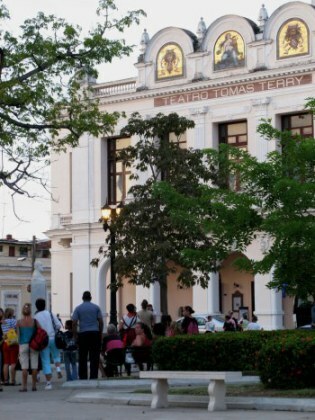 Terry had offered the then Governor 60,000 pesos: 50,000 pesos for the building of an ornate and distinguished theatre, and 10,000 pesos for the Charity School for children, with proceeds of the theatre supporting it. He died the following year in Paris, but his family carried out his wishes with a bequest of 100,000 pesos to be administered in a management fund. The resulting ornate resulting theatre imitates Italian horseshoe-shaped design, with four tiers. On the façade are mosaics by the famed Venetian glassmakers Salviati of 19th century Venice, who also had premises in Regent Street, London. 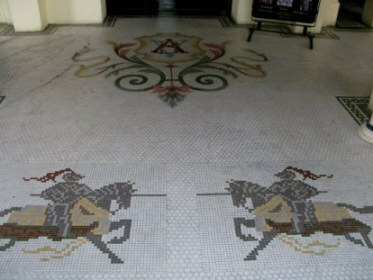 The London location now houses the Apple store: the mosaic arms of Venice within were restored in 1999. Salviati had also been commissioned to create the altar screen at Westminster Cathedral, the mosaics above the high alter of St. David’s Cathedral in Wales, and the Albert Memorial. Such was the prestige of the Terry Theatre that it could draw on such a famous house of art to create the allegorical figures of the three muses of comedy, tragedy, and music. 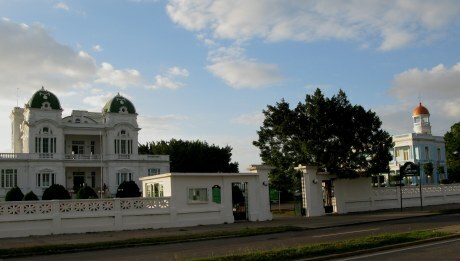 On an adjacent edge of Jose Martí Park in Cienfuegos is the José Ferrer Palace, built in the early 1900s. 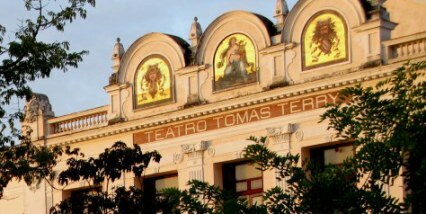 In 1920, Enrico Caruso stayed there while performing at the Tomás Terry Theatre. The owner moved to Havana shortly thereafter, having lived in the grand building for but a few years, and the newspaper printing press for 'El Sol' - 'The Sun' newspaper was subsequently installed on the ground floor. After the Revolution the ground floor served as a pharmacy. 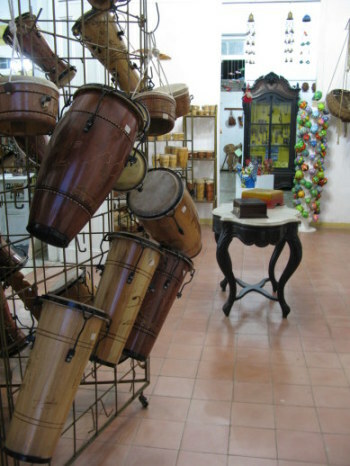 The Ferrer Palace now houses a cultural centre, with a fascinating array of locally crafted goods within the vestiges of its former magnificence. 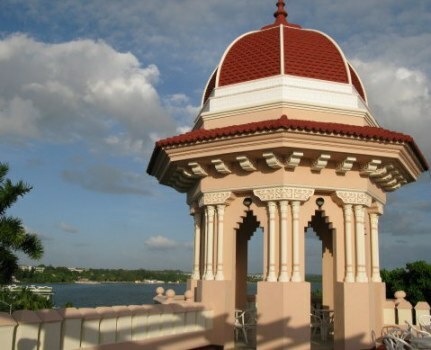 The elegant verandah gave a clear view for the merchant to keep an eye on activities of the port. 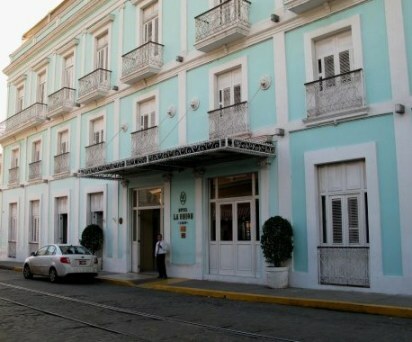 Next to live there were the Cacicedo family until the nationalisation of medical supplies following the revolution saw a pharmacy and distribution centre established on the ground floor. 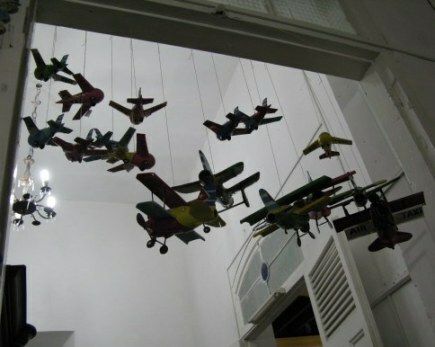 Now it is a carft and arts centre. 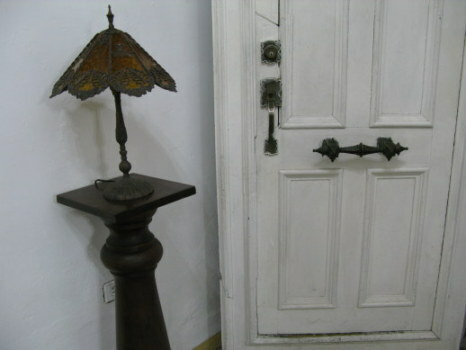 I loved the aging beauty of the locks on the door as much as the art deco lamp! 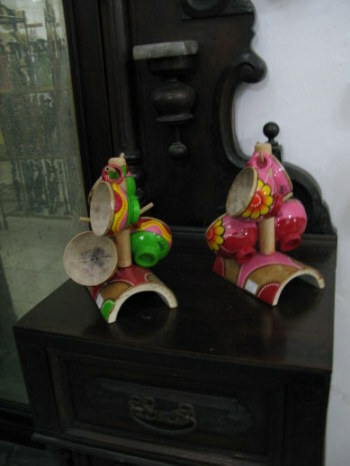 … colourfully painted cups made out of coconut shells. 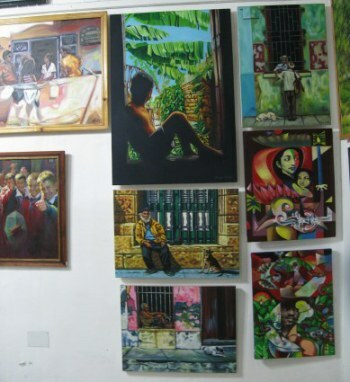 Local artists exhibited their paintings in many styles. 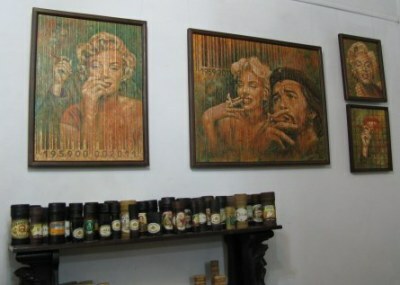 Of course it would be no Cuban souvenir shop without Che…but here he formed an unusual union with another icon...Marilyn Monroe, something I found to be an interesting juxtaposition, the relationship of which escaped me. I have not been able to find any reference to them meeting and so imagine it is a merging of icon imagery, and no more. It is an interesting one: both smart and attractive - and both dying tragically and with ever continuing mystery around their detahs. and only endure their realities. 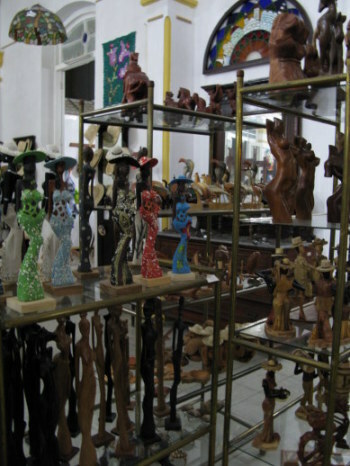 There were wood carvings- some unique but many versions along a theme. 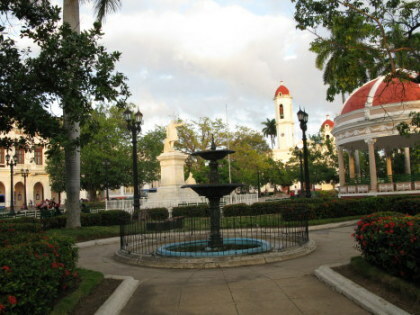 In Cienfuegos the Parque José Martí on the Plaza de Armas, with its marble statues of Marti is a refreshing place to wander. A few steps away inset intot he pathways is the zero kilometre mark which marked the point from which the first 25 blocks of the city were measured. 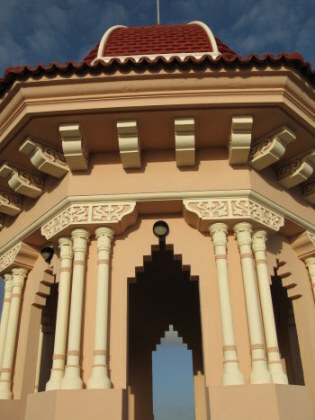 The guardian lions were the first statues of the new park. The park has many beautiful marble statues. One is to a liberal press founder and newspaperman who, in 1868 wrote under the pen name of 'El hijo del Damují' promoting a campaign of freedom for Cuba. There is a bust of Clotilde del Carmen Rodríguez, a writer of the same period, about whom it is hard to find many details - even in Spanish. The bust below is of Brigadier Ramón María de Labra. 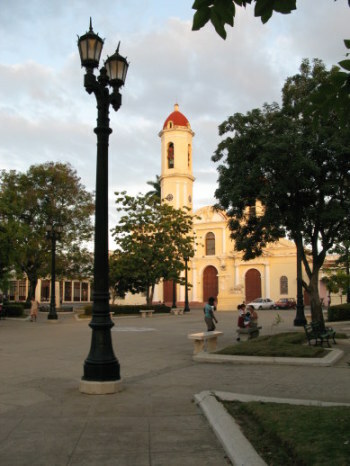 He was appointed as Military Governor of Cienfuegos in 1844 and in the same year set about establishing street lighting in the city. He then had a newspaper established and refufurbished the market so that it had more space and airiness than its predecessor. Ramón María de Labra was a forward thinking and educated man who valued education and established eight educational centres in the city. Under his governorship the city was garnted its coat of arms from the Quuen of Spain. 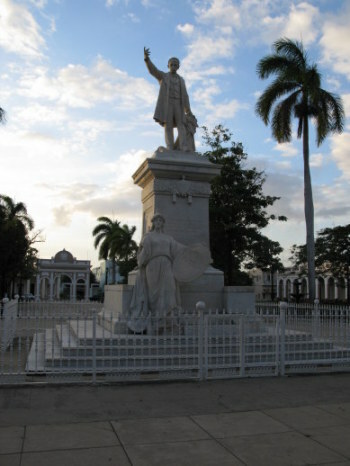 Labra only governed for four years before returning to Spain, but left a positive legacy that is highly held by the people of Cienfuegos who had this statue placed here in 1919. In reading about this I read that Ramón María de Labra was considered to be 'one of the brightest Cuban politicians of the second half of the 19th century'. Cienfuegas has produced some remarkable social reformers. Another small memorial in the park is to Alfredo Méndez Aguirre. A medical doctor, he rose to be Director of the Hospital Civil and although paid to be in a management role, continued to see patients free of charge. This naturally caused him to be highly respected - and even more so when he was elected Mayor and resigned after two months when he refused to collude with the policical/gaming relationships of his fellow politicians. Méndez Aguirre was a leading surgeon who introduced forefront surgical procedures to the city. His hospital reforms included setting up a hospital laboratory, the radiological department and an autopsy room. He also introduced administrative reforms that reduced charges and he improved the hospital medical assistance system. In 1912 he established a ward for the Veterans of the War of Independance, furthjer endearing himself to the community. 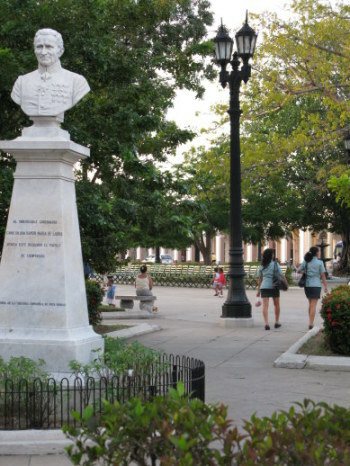 In Parque José Martí, sits a bust of another remarkable man, Salvador Acea de los Ríos - whose bust is just labelled Acea. 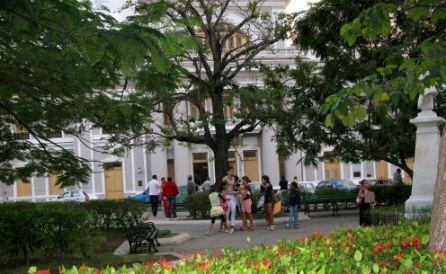 Havana born and becoming a councilor and Deputy Mayor, Acea y de los Ríos was a financial supporter of José Martí. Following the revolution he served on the local board to advise the new government on local issues. When he died Acea left his whole fortune to the city with instructions for a school of handicrafts for boys and one for girls, plus a nursing home for the elderly to be built. 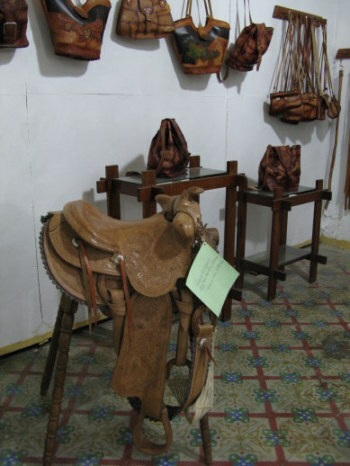 The San Lorenzo School of Arts and Crafts, the Santo Tomás Home School and Nicolás Acea Nursing Home for Elders are the results of his bequest. 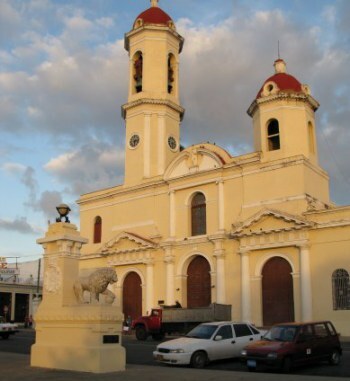 This lovely cathedral sits at the edge of Parque José Martí. The imposing Tomás Terry Theatre on its flank is a great meeting place or somewhere to just sit outside and watch the world go by. It was here that this little girl in the park with her grandparents toddled over to give me a tiny red flower . It has since sat on my keyboard to remind me of my one month with no plan in Cuba - and the unexpected gifts it brought me as I experienced Cuba from a less touristy perspective. As I sat, I noted the throng of little girls waiting before the theatre. They moved and danced through their space like so many bright butterflies and were clearly awaiting their dance lesson or rehearsal. Suddenly they rose as one in a kaleidoscope of colour and I saw them rush to greet the dance teacher, who then was escorted by the girls to the theatre. Watching those happy young faces, I was reminded that dancing has always been a Cuban specialty and that even though other things are rationed, the chance to learn to dance is not. 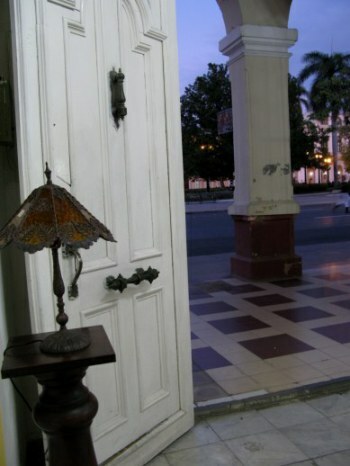 Seeking out a Casa Particular in Cienfuegos, a perfect one was found on the Malecón. Unfortunately I have lost the name but drive along the Malecón and you will see it. It is perfectly located with great views. 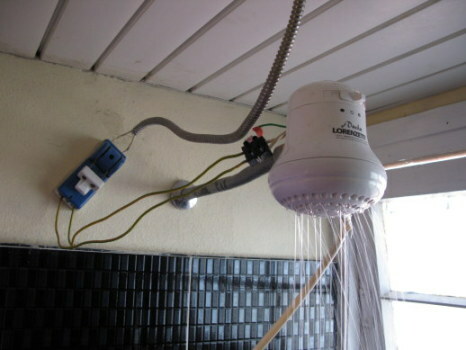 …and another of the standard things of Cuba – a modern shower that from a viewpoint of someone used to other arrangements, seemed to threaten electrocution. However, after a short time outside tourist hotels, one becomes quite inured to the realities of Cuban life, and 'interesting' electrical wiring is one of them. 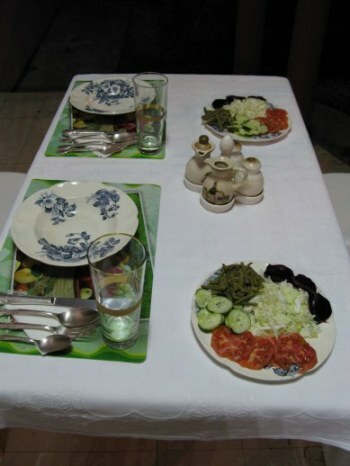 The lady of the house could not have been more accommodating and the rooms are large and comfortable. This 'Home away from Home' was not far from the yacht club. 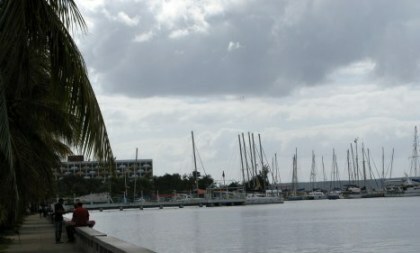 It is always something of a shock to me to see the valuable boats moored in the few Cuban marinas there are– but these marinas are big business. This one sometimes has reports of beacons and navigation lights not working. It has been reported that the usual Cuban volume of the music (LOUD) in the nearby club makes sleeping aboard a challenge, but all personnel speak English and it is a main port of entry with all services…and friendly ones. 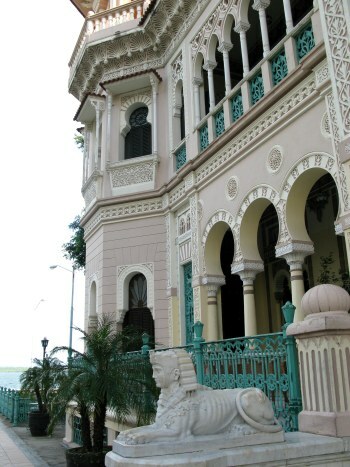 It is a curiosity of old Cuban legislation that at one time lions were only permitted to decorate the outside of diplomatic or consular residences in Cuba. 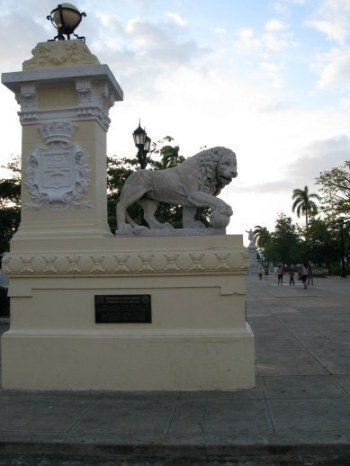 In Cienfuegos, on the Prado between Avenues Santa Cruz and Santa Elena, these two bronze lions are all that is left of what was once one of the most celebrated meeting houses for soirees and social events in all of Cuba. 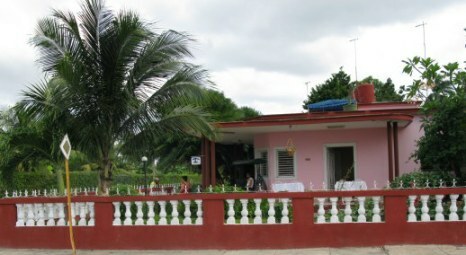 This was the home of the British Consul General at a time when the Consulate was charged with administration of the submarine communications cable which connected via Santiago de Cuba, to America, and from there across the Atlantic to Europe. It appears that the house was originally constructed about 1862 and has served variably as a Casino, the site of the Philharmonic Society, and eventually the home of the city governors. 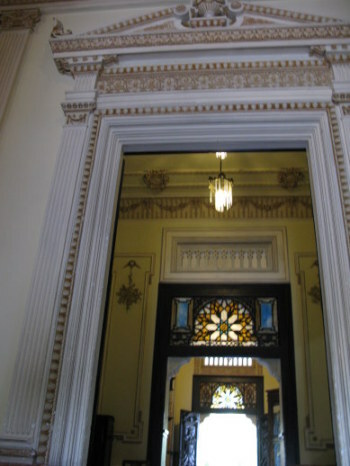 It now reputedly houses a family of cobblers and little is left of its former interior splendour, though the British Lions still stand guard. This was a statement by Elizabeth (Lisa) Kenny, the Australian nurse whose radical challenge to the medical community to exercise the limbs of polio victims instead of immobilising them led to the foundation of the practice of physiotherapy. She had to be a lion for at least a day to accomplish a change in medical parctice. 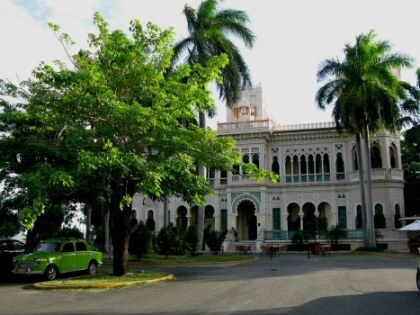 One of the great 'follies' of Cienfuegos is the Palacio de Valle. 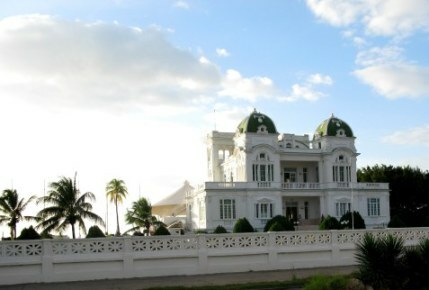 This is an opulent mixture of French, Italian, Arabic and Cuban architectural styles. 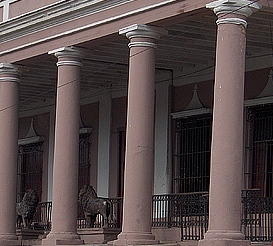 The Valle Palace overlooks the entrance to the Bay of Punta Gorda and was the creation of the Asturian industrialist Acisclo del Valle. 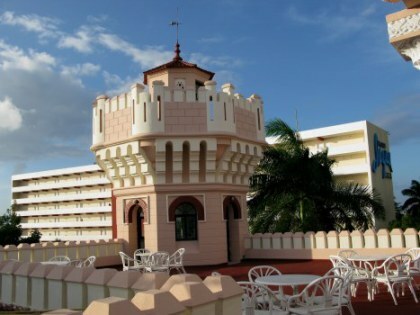 Built in 1913 the roof supports three tower: one inspired by Gothic style. 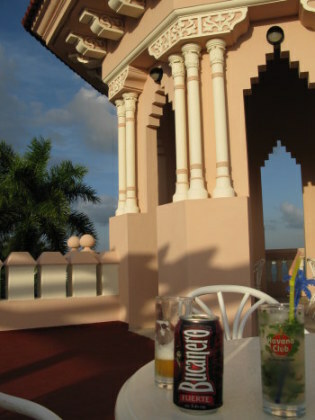 .. it was here on the rooftop terrace of Palacio de Valle that we had the most expensive drinks in the whole 'Month with No Plan' Cuban trip …beware! 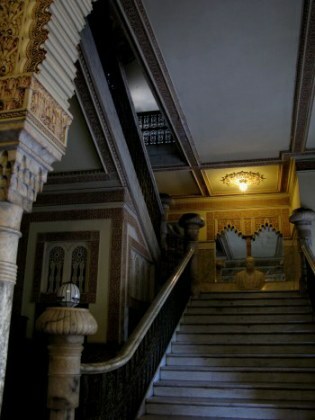 The entrance of the Palacio de Valle is Gothic, with Moorish terraces, and a music salon in the style of Louis XIV. 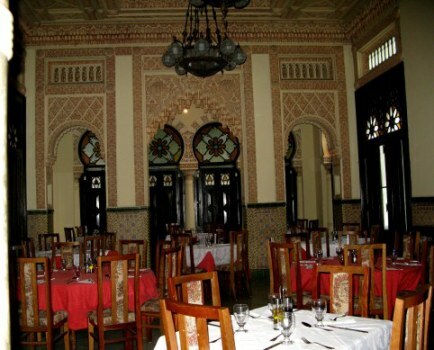 The dining room is Neo-Mudéjar style – a Spanish variation of Moorish architecture, featuring horseshoe arches and Arabic patterns and accessories. 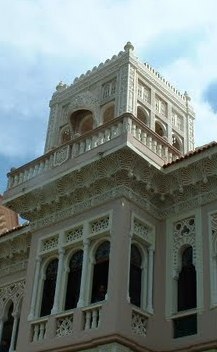 Materials for the embellishment of this lavish building were imported: ceramics from Venice, Spanish ironwork, and Puebla Tulavera tiles from Mexico. … the whole costing 1million pesos. 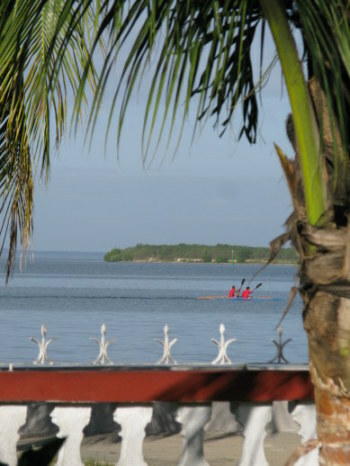 The whole Punta Gorda peninsula of Cienfuegos is a legacy of grander times…with The Blue Palace, built by a wealthy tobacco plantation owner and now a hotel sitting next to the gracious Cienfuegos Yacht Club, on a boulevard of once grand homes. 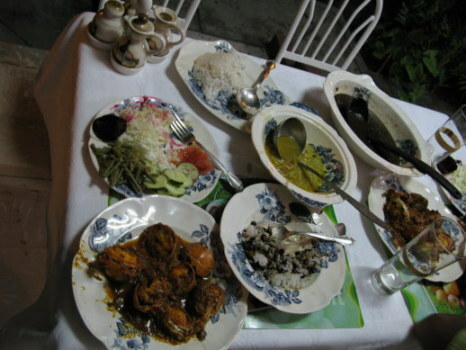 The Cienfuegos Yacht Club is notable more for its remarkable position and architecture than its variable quality food – but like its neighbouring Valle Palace, the location on the Punta Gorda is hard to beat. Seeing the decay of former architectural magnificence reminded me that these were buildings built on the work of slavery. While understanding the economic imperatives, I was sad to see only selective restoration, leaving much to be carved up in the essential need of a growing population to secure housing in a diminished stock of available buildings. 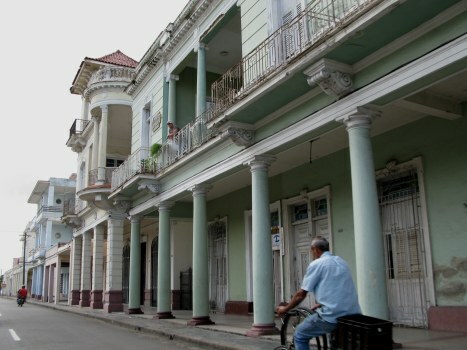 Even more, I was saddened constantly in Cuba – and especially in Cienfuegos - by the apparent inability of those surviving the revolution to see and value architectural beauty. the most difficult part to invent is the end.